Panic disorder is a remarkably common psychological condition, characterized by sudden attacks of intense fear and panic. Approximately 3% of the population will experience some aspect of panic disorder during their lifetime. Incredibly distressing, it can have an adverse effect on most aspects of the person's life, especially if chronic. 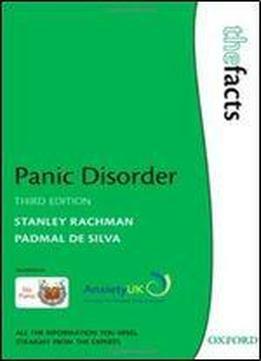 This new edition of Panic Disorder: The Facts includes valuable new information on treatment and discusses the relationship between panic disorder and other anxiety conditions. It also assesses the evidence for the available treatments, drawing from the latest scientific research. Up-to-date information on the nature, symptoms, causes, theories, and treatment of panic disorder is provided, all in non-technical language. The chapters on treatment give a detailed account of psychological therapy and also discuss drug treatment. Numerous personal accounts are given throughout the book, highlighting various aspects of panic disorder and its treatment and management. Though mainly intended for sufferers of panic disorder, and their families and friends, it will also be of interest to the general reader, and to health care workers. Clearly written by two leading experts, the book is a valuable source of information for anyone affected by this disorder.